Amongst the increasing number of moths, butterflies and caterpillar sightings being received from the African continent have been some fascinating records from Zambia. 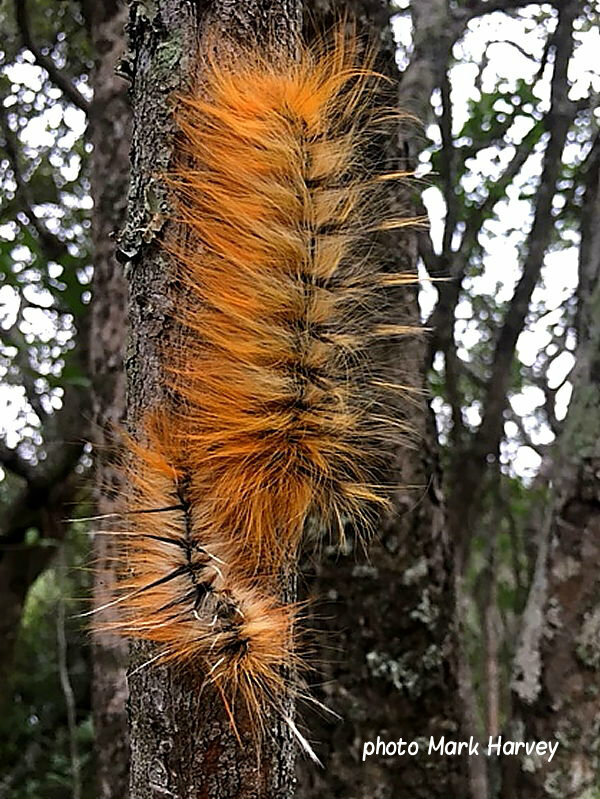 This amazing caterpillar, Pachymeta robusta, also known as the Msasa worm, is one of many sightings received from experienced wildlife safari guide Mark Harvey in Zambia. What appears to be a discarded skin beside it suggests it has recently moulted. Amongst many Pachymeta robusta larvae feeding on Brachystegia spiciformis Mark also noted several pale larval forms. His amiable manner and wealth of knowledge of the flora, fauna and ways of the wild, have earned him the reputation of being one of Zambia’s finest Guides. As well as guiding big game safaris Mark also contributes greatly to Zambian wildlife recording by collecting insects for the Natural History Museum in London. Featured below are just two of the many moths Mark has recently attracted to light – the colourful saturniid moth Bunaeopsis jacksoni and The White Banded Nephele Hawkmoth, Nephele rosea. The magnificent Fulvuous Hawkmoth caterpillar shown below was another of Mark’s Zambian finds. 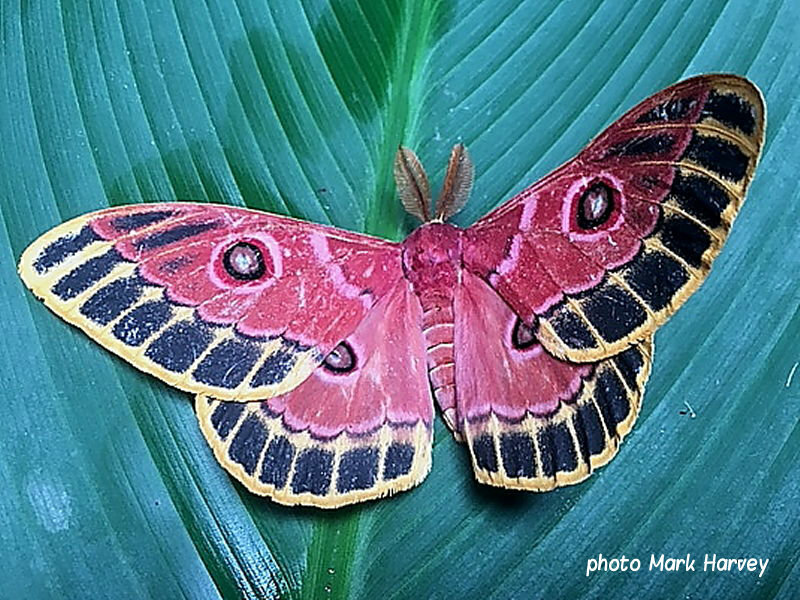 Many of Mark’s sightings of Hawkmoths (Sphingids) and Emperor moths (Saturniids) will be included in the soon to be added African moth, butterfly and caterpillar galleries. Please see footnote regarding identifications. Amongst the thousands of beetles, butterflies and moths Mark has collected over the years, several have been new to science. His latest discovery being a Dung Beetle which now carries his name – Catharsius harveyi. Now, I’m not certain how having a dung beetle named after you has gone down with Marks wife but it seems a very appropriate accreditation given the critically important role such insects play in the whole ecosystem and its animals that Mark so cares about. Anyone interested in contributing to the recording and adding to our knowledge of African lepidoptera are encouraged to rear caterpillars. By following a few basic procedures the rearing of many species is often a simple process. It also happens to an enjoyable and rewarding one. Please note that although most caterpillars are safe to handle some have urticating hairs and may cause allergic skin reactions. Consequently, as a precaution, skin contact should be avoided. Caterpillars can be easily reared and moved onto fresh foodplant without handling. In parts of Africa, identifying caterpillars and moths is not always straight forward as many aren’t well researched. In particular, little is known about the early larval stages of many species. While considerable effort is taken to provide correct identifications errors could occur. Help and suggestions on identifications are always appreciated. Sightings received are welcome, with images accredited and the copyright remaining with the photographer. Where of particular interest, sightings may be shared with those involved with African recording.